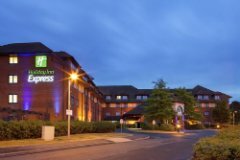 The welcoming Holiday Inn Express Birmingham NEC is just 1 mile from junction 4 of the M6, connecting to the M40 and M42. There's a complimentary breakfast with hot items in our inviting Great Room. 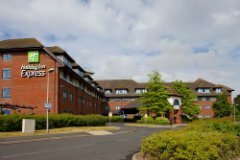 Just a mile from the exhibition centre and 2 miles from Birmingham International Airport, the hotel offers good value accommodation coupled with friendly and welcoming service. All rooms have private bathroom, Flat Screen Satellite TV, tea/coffee tray, hair dryer, High Speed Internet Access & WiFi, Desk Workspace, family rooms consist of a double bed and a pull out double sofa bed. Transfers are now by taxi, direct to the airport. From 07:30 to 10:30 and 16:00 to 20:00, the hotel will give customers a voucher for their journey. Outside of these hours, the taxis will cost £8 each way. A free mono rail can be taken to Birmingham International Airport, from the station. Transfers are now by taxi, direct to the airport. From 07:30 to 10:30 and 16:00 to 20:00, the hotel will give customers a voucher for their journey. Outside of these hours, the taxis will cost £8 each way. The hotel have a bar menu available from 6-10pm daily. Family rooms consist of a double bed and a pull out double sofa bed. Children should be under 18 to share family rooms. 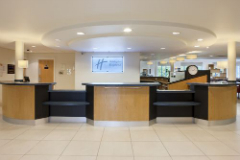 Very good clean and well maintained and also helpfull reception staff. Excellent overnight stay before our holiday.We even had an help yourself very early breakfast.Staff were very pleasant. Everything fine except no obvious information about how transfers and parking actually works. Better information/communication is necessary. 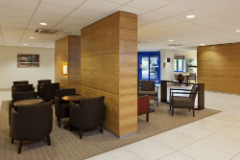 Excellent hotel with great facilities both local and in the hotel. Service from staff was very good and the standards of the rooms were well above those experienced in other main stream hotels. 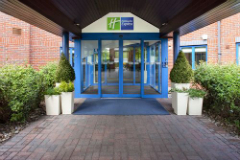 The hotel is located at the National Exhibition Centre and is off junction 4 of the M6 or junction 6 of the M42. Once you have left the motorway please follow the signs for the NEC. 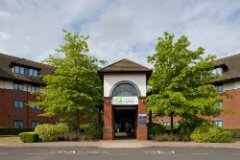 Once within the NEC complex please follow the signs for the north car park and signs for the Holiday Inn Express. Taxi Charge (one way): approx. £ 7.00 GBP View More Exit out of the train station. Turn left onto Bickenhill Parkway. Follow signs for NEC. A shuttle bus service is available 7.30am - 10.30am and 4pm - 8pm to Birmingham International Train Station, at a cost of £2.00 per person. A free mono rail can be taken to Birmingham International Airport, from the station. Payment is taken via a token machine in the hotel reception, prior to your return journey to the station, please hand the token to the driver. The charge includes shuttle pickups from the Station. The hotel cant reserve seats, therefore we are unable to guarantee space will be available at specific times during high demand periods.